This tea is the only private labeled tea produced by Bana Tea Company. The tea’s leaves are selected from tea trees that are between 100 to 400 years old. The production of the tea cakes were personally supervised by tea Master Vesper Chan. 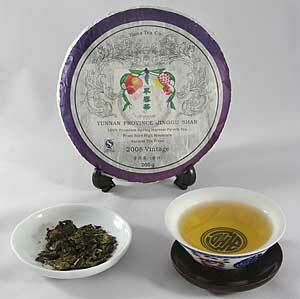 The dried leaves emit a nice aroma and the yellow-orange tea liquor presents a dried apricot flavor unique to teas from Jinggu Mountain. Followers of this tea enjoy the "hui gan (returning bitter sweet)" that coats the mouth and throat and its balanced and comfortable "Qi." Teas of this high quality are becoming rare finds. We are now offering a 5-pack of Bana Limited Edition in their original "tung" packaging (see photo at left). 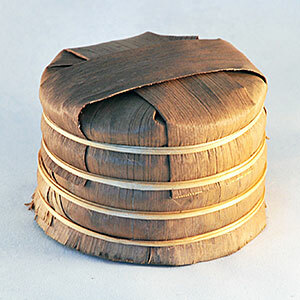 The cakes have been aging nicely in their bamboo leaf tungs since their spring harvest in 2008. As an added bonus, we are giving a 10% discount when you purchase the 5-cake tung. Use 4-5g of leaves per 6 ounces of water. Rinse the leaves once with hot water (195 degree F) and discard the water. Start steeping with water at 190º F and brew according to the recommended steeping time below. I tried the Silver Tip and the Limited Edition Spring harvest - both were terrific.